This yarn is so wonderful to wear around your neck. 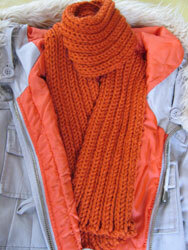 If you're looking for a simple yet luxurious scarf, you've got to make yourself one of these! Row 1: k2, *p2, k2*, repeat from * to * to end of row. Row 2: p2, *k2, p2*, repeat from * to * to end of row. Repeat rows 1 and 2 until you have about 3 feet of yarn left. Bind off loosely in rib. Weave in ends.